Obesity is still on the rise. In many cities there have been decade-long campaigns to improve healthy food access, spread information about health risks, and new national efforts to get children active – are they not working? Latest estimates predict that by 2030 almost half the adult population will be obese. Recently, the CEO of the Robert Wood Johnson Foundation (RWJF) wrote in the Washington Post about their latest report and the future impact of obesity on our economy. She noted the decline of productivity and increasing health care costs associated with obesity. While we often think about fast food, inactivity, and individual choices related to being obese, how often do we consider the economic causes and effects? I have never met anyone who said that they specifically chose to suffer the health effects of being obese because they thought it would be a great way to live. However, beyond personal choices, obesity can be correlated with a number of social and environmental factors, namely: poverty, urban areas, as well as minority and low-income populations. Just as individuals cannot choose their parents, they also cannot choose their life circumstances, which unfortunately can sometimes hinder efforts to live a healthier lifestyle. Research has shown that rising rates of obesity disproportionately affect Black and Hispanic populations. This demonstrates a confluence of factors with roots in racially motivated housing policies, lack of social mobility due to historical discrimination, and the absence of adequate health services for these communities. Impoverished communities are filled with companies looking to take advantage of the marketplace of poverty. Dollar menus, frozen dinners, and corner store snacks – not to mention the advertising which helps build a psychological belief that it is quicker and cheaper to eat unhealthy foods. In short, obesity is just as much an economic reality as it is a need for healthier lifestyles. It represents a by-product of mass producing foods to reduce costs and increase profits. People do not choose to live in poverty nor do they choose to be obese. Economic constraints on top of fast food advertising drives a culture of unhealthy eating. The debates have raged about recent plans to tax the size of soda pop in New York City or in other countries the tax on fatty foods. There is a growing field of research on behavioral economics, which argues that people will choose the option that is most beneficial to themselves. This is, however, not always true. People do not always make the most rational decision especially when it comes to their food and eating habits. Increasing the economic burden on people who typically choose unhealthy foods is not necessarily the best option. If a tax is placed on high-calorie or high fat foods it allows the food and beverage companies to continue avoiding responsibility. It isn’t about personal freedom, it is about being able to compete in a marketplace where the cards are constantly stacked against the poor. Food and beverage companies will still find a cheap way to produce their products that works around any tax or restrictive policy. These companies have a primary goal to make a profit. If making that profit means burdening the population with unhealthy foods and the long-term health effects, they have no qualms. This is where people generally argue that it is about personal choice. This is partly true, but also relates to my first argument that you can’t always choose your life circumstances. All around the world now people are struggling with obesity and healthy eating. Food and beverage corporations are able to take advantage of global income and food disparities to generate their profits. Using a “fat tax” to increase the economic difficulty of buying unhealthy food is doing no good when there is a psychological war on TV and advertising campaigns. We can talk all day about the responsibilities that corporations have to give people healthy foods as well as the responsibility of individuals to keep themselves healthy, but in the end it all comes down to behavior. When I say behavior I’m talking about the eating habits that people have learned since their childhood, the behavior influenced by the food commercials seen on TV, the behavior informed by the massive portion-sized, “give me what I paid for” food culture. When we are constantly bombarded by images of juicy burgers, steaming pizzas, and actors telling us how amazing it is to get quick, cheap food – we will eventually believe it. Food and beverage companies employ their own teams of psychologists to be able to manipulate their advertising to be the most convincing. These companies have found out the best ways to exploit the disparities that people face in order to get more people to buy their unhealthy foods. Don’t have time to make dinner? Bring your kid through the drive-through. Buying groceries on a budget? Get 3 for $5 cases of pop or 2 for $5 bags of potato chips. When it all comes down to what will or won’t work, people need to understand what they are up against, they need to be informed on what foods will benefit their health, and they also need to be able to have the tools to make healthy lifestyle changes. While many food companies watch their profits grow, many individuals watch their weight grow due to their own economic disparities. Helping people address these learned behaviors and economic barriers will help to reduce health care spending and increase the productivity of our economy. Whether they are starving or eating too much, children around the world are malnourished. A full belly doesn’t necessarily mean that a child is getting proper nutrition from the food that they eat. Obese children are just as nutritionally deficient as children who have bloated bellies from hunger. The result is a global generation of unhealthy children who will experience a shorter life expectancy than normal from complications with their health and related diseases. The double burden of malnutrition is seen in both a complete lack of access to food and an overabundance of unhealthy foods. A recent World Health Organization (WHO) report stated that combating five major health factors could eliminate millions of premature deaths. Among those top five is childhood nutrition. Lacking nutritious food has serious implications for health, but consuming too much food without nutritional value, which contributes to obesity, is more likely to lead to a premature death. For the first time in 15 years, children in the US have a lower life expectancy than their parents. By the same token, children in countries defined as “developing” have faced low life expectancies for many years, but what they eat (or don’t eat) is less likely to kill them. Who would have imagined that being overweight is more likely to kill you than being underweight? On the flip side of childhood nutrition is the near complete lack of access to food in developing countries. There were any number of crises this past year that qualified the “need” for food aid from “developed” countries. Floods, earthquakes, droughts, famines, etc. – but what is the state of food aid? Is it excellent nutritious assistance in difficult times? Bill Easterly and the Aid Watch blog ask: “Can the story on US food aid get any worse?,” noting that the US continues to support relief agencies that use a corn-soy food blend that doesn’t even meet the 1960s international nutrition standards of food aid. Children in developing countries don’t necessarily die from a lack of nutritious food, but rather from the diseases that attack their weakened immune systems. The food we eat is a first line of defense by keeping the rest of our body systems healthy. Some of the best examples of the importance of food and health come from Paul Farmer, who often says that, “the treatment for hunger is food.” Many times food is overlooked as a critical treatment in health crises, which makes it that much more important to invest in nutritious alternatives for food aid and support local farmers around the world. Unfortunately here in the US, corporations have a firm grip on what we eat. There are a small number of major factory farming corporations that produce our food. They use coercive actions and their money to keep control of farmers and the food industry. This hurts our families and communities here in the US and contributes to the nutritional inadequacy of what Americans eat, but it also has far reaching implications in developing countries. Because of the control by US corporations of the food industry and the US government’s subsidies for farmers, food prices have been rising steadily around the world. This impact is hitting small farmers in developing countries hardest as they struggle to find markets to sell their produce and support their families. These small farmers can’t compete with US farmers who are government subsidized or the US corporations who are mass producing and shutting them out. Even as people in developing countries struggle to buy food to eat, one in six Americans are struggling with hunger. This is largely a result of the economic downturn and has affected more than just those already considered poor in the US. It is estimated that nearly one billion people do not have access to a secure source of food around the globe. While the fact that many Americans struggle with food security is shocking, the spike in rates of obesity demonstrates the pressing need for communities to rethink how they eat and live. Obesity gives a blatant visual representation of how much control we have lost when it comes to our food. The WHO states that “globesity” is spreading across the globe and millions will suffer if we don’t make changes. A recent study conducted by Wayne State University showed that one third of infants in the US are obese or at risk for obesity. This allows us to easily assume that an obese infant will become an obese adult. Hunger and food security are extremely important issues when it comes to talking about health and nutrition. Many who suffer being underweight have suffered through natural disasters, but the immediate threat to children and the global population is the man-made disaster of being overweight. Thankfully there are many people who are working to fix the food industry, support local farmers, and promote healthy eating to children in schools. President Obama recently signed the Child Nutrition Bill to increase access to healthy foods in schools. Where there have been numerous policy barriers nationally and internationally, this is a step in the right direction to bring policies in line with the health needs of our global population. We must commit to supporting the basic health of our children if we care about a building a healthy future. Originally featured and posted at, Americans for Informed Democracy on 18 January 2011. *Please note, the names and details of program participants have been changed to ensure anonymity. After working with one of my first families, we’ll call the teen Larry, I began to feel limited by the research aspect of my current program. Since it is a research program testing various protocols for successful weight loss, my options and actions were often limited in what I could or could not do to help the family. At the time Larry was the heaviest teen in the program. I remember he was late for our first session at his house because he had missed the bus. I saw him walking down the street and knew immediately that he was who I was waiting for. Larry had knee and ankle problems as well as hypertension at age 15. At the time he was the heaviest teen in the whole program. I built a strong rapport with the family and really enjoyed going to their house twice a week to work with them. Larry‘s weight fluctuated often, spiking and dropping dramatically from week-to-week. The family often attributed it to the medications that he was taking that cause him to retain water. However, over the first half of the 6 month program, Larry had lost about 20 lbs. from his starting weight. His Mom reported losing about 25 lbs. from participating and helping Larry during the program. She no longer needed to regularly wear oxygen and could walk more often than she was previously able. In the last two months, Larry began to gain the weight back. Since his weight fluctuated so much it was hard to tell if he was really gaining a significant amount or if it was just related to the medications. By the final session of the 6 month program Larry had returned to his starting weight. His weight loss is considered significant and for him to gain it back is a red flag for larger problems. Research shows that when lost weight is gained back quickly it is much more difficult to lose again. His Mom was worried, he was confused, and I was unsure what to do. I gave the family additional information about other programs that Larry could participate in, but focused on affirming the skills that they had learned and the successes they had over the last 6 months. It was during the following couple of weeks, which turned into months, that I really began dissecting Larry‘s dilemma. He was a very bright student, had some nice friends who helped him be active, and a very caring mother and grandmother. He took on more responsibility than most because his Mom wasn’t very mobile and yet he was unable to maintain his success in the program. I began to think back to other issues that the family dealt with during the program. The major one that jumped right out for me was their access to food. Larry and his Mom were getting food assistance and usually shopped once a month when the Grandmother could drive them to Meijer, which was located in another city. The family mostly ate frozen dinners that Larry could heat up in the microwave. Larry‘s Mom would often report that he had eaten all of some food after they returned from the grocery store. Further research has identified connections between obesity and food stamps. The research found that the majority of food assistance receipts went shopping once a month, right after the food assistance amount is credited. In this situation, regardless of how committed the family was to weight loss and helping Larry manage his obesity, they were economically stuck in a cyclical nutrition pattern that would negatively affect his weight no matter his level of motivation. Socio-economic factors will win out over motivations every time, no matter the intentions. This is where human research is limited because the cause for failure is not pegged on the systematic inequality related to racial minorities and food assistance programs, but rather it is placed on Larry and his family for being unable to keep up with the program guidelines. I keep reminding myself that this research will be applied to other programs in the future. Those programs will be able to replicate tactics that were most helpful and hopefully help even more adolescents in programs with more room to address multiple issues: medical, social, and economic. In many cities across the US, cycling is growing in popularity and local governments are working to implement bike-friendly urban planning initiatives, but is it growing fast enough? The US ranks first in the world for percentage of population that is obese (34% for adults age 20 and older). Not surprisingly, the US also ranks near the low end for bicycle usage with 1% or less of its population using a bicycle. Bicycles have been around for a long time. There is a sketch for an early bicycle design in one of Leonardo da Vinci’s pupils’ notebooks from 1493. Over the years bicycles have been upgraded and modified, moving from being a luxury of the wealthy to the transportation of the masses. 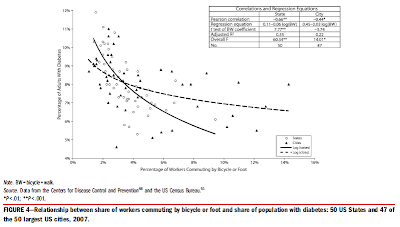 The advent of cars slowed bicycle usage in industrialized countries, but in less economically developed countries bicycles are still a primary mode of transporting people and goods. Likewise the production of bicycles has remained nearly double that of cars. 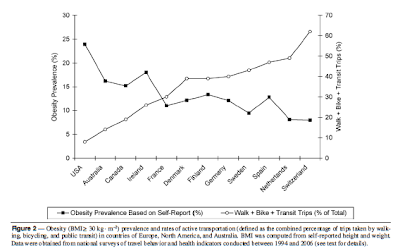 For many countries bicycles are at the front lines of public health, they just may not realize it. The US has been watching a steady rise in obesity rates as a result of inactivity and unhealthy diet choices. Many states and cities are working to implement programs to increase bike usage including: Rails to Trails projects, Bike sharing in Washington DC and Nashville, as well as increased bike lanes linking residential areas to commercial zones. These programs will all have a big impact of the health of the US population. The CDC states that the number on strategy for increasing physical activity is shifting from car trips to walking or biking. 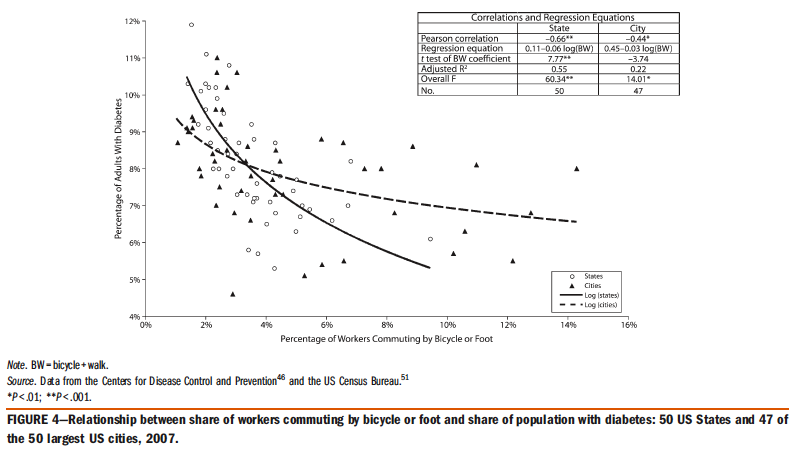 Bicycling Magazine notes that new bicycle commuters can expect to lose up to 13 pounds their first year of biking to work. However, the US isn’t the only country working to get its citizens moving. Copenhagen (Denmark), known for being a biking city, launched “You won’t believe it… You’re safer on the bicycle than on the sofa!” A campaign run by the city’s Public Health office, their goal was to get more people biking to work instead of taking their car for a short trip. The campaign told Copenhagen residents, “Lack of movement in everyday life is harmful to health, while physical activity keeps the body healthy. Daily exercise for at least 30 minutes prolongs life by up to 5 years, and cycling can thus help to prolong life.” Even as a strong biking city even Copenhagen felt the need to better educate and mobilize its population. 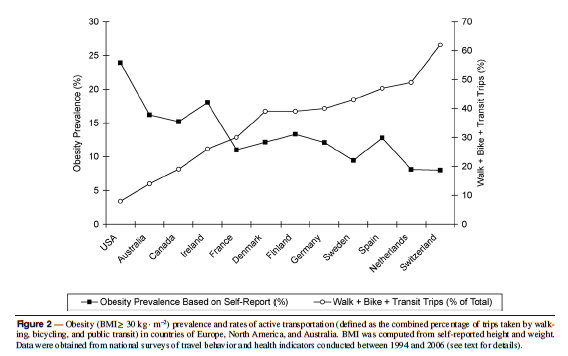 As can easily be guessed Denmark has a low rate of obesity at 9.5%. In “developing” countries of the world obesity rates aren’t the greatest health risk, nor is low physical activity often a common unhealthy lifestyle. The health risks in “developing” countries are often related to access to health services and emergency transportation. Surely this isn’t an area where bicycles can have an impact! In many low resource setting around the world, Community Health Workers (CHWs) travel from village to village, home to home to deliver health education and services. In many places CHWs rely on bicycles as their only means of getting from one place to another. Bikes Without Borders highlights the work of CHWs in Malawi utilizing bikes to increase their effectiveness and to help more people. Bicycles for Humanity collects almost 50,000 bikes a year and sends them to organizations that distribute them most often to healthcare workers and women. Since women do a majority of traveling in “developing” countries, a bike can help them to transport themselves, water containers, and goods to market. Bicycles have even been modified to serve as ambulances in areas where there is no emergency transportation. The Bicycle Empowerment Network (BEN) in Namibia has implemented a very effective model for faster transportation where there is none. Drivers of the bicycle ambulances come from local organization and they receive training on use and maintenance. Whether it is in the post-industrial cities of the US, modern cities of Europe, or in some of the world’s poorest regions, the simplest transportation technology can have huge impacts on the future health of our population. Featured on the Americans for Informed Democracy Blog, where I’m blogging as a Global Health Analyst.